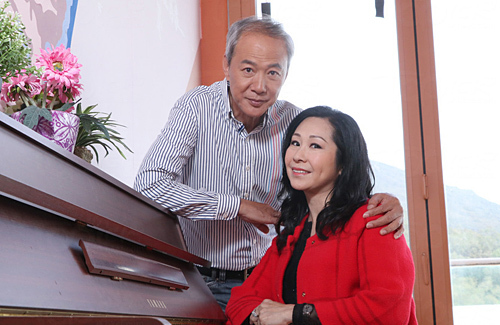 TVB artistes 62-year-old Chan Wing Chun (陳榮峻) and 57-year-old Helen Ng’s (吳香倫) love story is well-known among Hong Kong viewers. Although the senior couple initially kept their relationship low-profile, viewers became very intrigued with their love story. 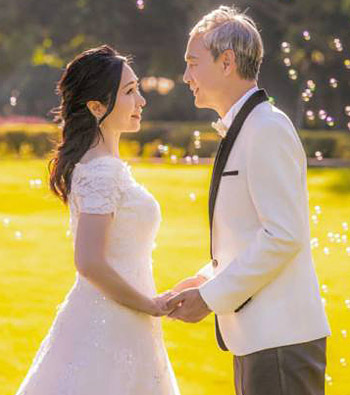 The couple’s wedding attracted many media reporters and many of their celebrity colleagues attended and sent their blessings. As opposed to others who may want an exciting and heartrending romance, theirs is one that is comfortable and easy. This is Chan Wing Chung’s second marriage, and Helen’s first. When his wife died after having a stroke in 2010, the actor fell into depression and didn’t think he would ever love another woman again. He met Helen on the set of Gilded Chopsticks <食為奴> and the couple started dating in 2014. He eventually proposed to Helen and they got married last July. It’s great to have a spouse at that age. It seems TVB have been very good case with them appearing in most scenes amd series together. It’s important that work does not take away the time they spend together…. I remember their faces!! How sweet!! Now, that sounds genuine. They are so sweet. I always have a soft spot for Chan Wing Chun.